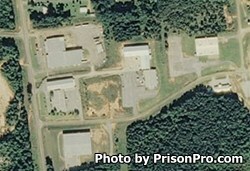 The Kemper Neshoba County Regional Correctional Facility is located in DeKalb Mississippi. It is a medium security facility that acts as both a prison and a jail housing long term state commitments and short term inmates who are awaiting trial. This correctional facility houses both adult males and females, no juveniles are incarcerated here. Male inmates are separated from the female inmates. The current capacity of this facility is 280 male state inmates, 100 county and joint county male inmates, 75 female state inmates and 12 female county inmates, with a grand total of 476 offenders. Inmates at Kemper Neshoba County Regional Correctional Facility may be eligible for work release which allows the inmate to leave and report to a supervised job within the surrounding community during the day, and report back to the prison at the end of the shift. The usually work release jobs include trash collection and cleaning county roads. While incarcerated inmates can also earn a GED, obtain an adult basic education and receive alcohol and drug treatment. We currently do not have the visiting hours for this facility, if you know the visiting hours please help us out by leaving a comment below. For more information contact the facility at the telephone number provided.